Round cages are not recommended for most bird species for a variety of reasons. First and foremost, round cages are dangerous for the inhabitant. Any animal in a round cage could easily get a toe, beak, tail, or entire foot or ankle caught in the small space where the bars gather at the top of the cage. This is a very real danger in and of itself, and you really don’t need another reason to reject this type of cage. But there are more reasons than just this danger of the V-shaped construction at the top. Most of the round cages on the market have poor welding and are shoddy in their construction. It is also very uncommon to find a stainless steel cage that is round. Stainless steel is the way to go when purchasing a cage, They are usually sturdy and of good quality. They last forever, they don’t rust and they are safe for your birds. They are easy to clean and maintain, and if you shop carefully, you can find a design that pleases both you and your bird. Stainless steel is an extremely neutral material that pretty much goes with any color schemes or decor you might have in your home. Round cages are difficult to maintain. Try and get a cleaning cloth into those tight spaces between the bars at the top of the cage. Dust, food particles and other detritus can get trapped in those small spaces between the bars, and it isn't sanitary for you or your bird. Most square cages are made with a built-in slide-out grate as well as a slide-out substrate grate. Round cages don’t come built this way. You usually have to pop the top of the cage off of the bottom grate and cage bottom to clean it, and it is inconvenient and messy. It is thought by some people that round cages are detrimental to a parrot's psychological health. The thinking is that birds are very intelligent creatures, and some birds have driven themselves crazy climbing around and around cylindrical cages, and feeling like they're never getting anywhere. They believe that giving a bird an angular cage provides them with reference points to different locations in their territories—thus helping them feel confident, safe, and secure. They also feel that the best set-up for a cage includes a wall behind the cage so that the bird knows nothing is approaching him from behind. This provides security, safety, and privacy on one side of the cage. Another reason to avoid round cages is that they are often awkward living spaces for a bird to inhabit. The shape causes a bird's feathers to be in constant contact with the cage bars, wearing them down and giving the bird a ragged appearance. Most round cages available are not very big and with pet birds, the bigger the better. There are octagonal outdoor aviaries in places, but you rarely see round outdoor enclosures. While round cages can often be difficult to maintain and keep clean there is another reason to avoid them. 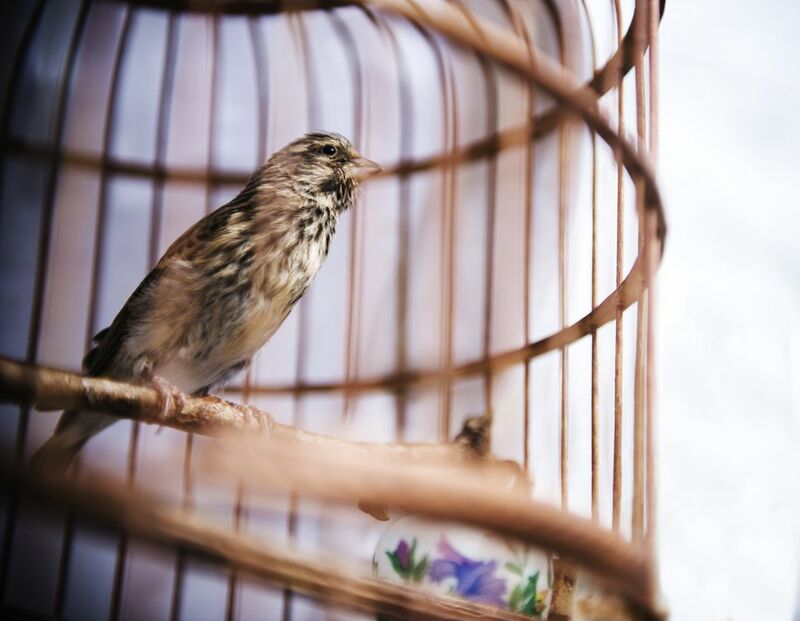 Because most bird cages are now square or rectangular in shape, it can be hard to find certain accessories that will fit round cages. Cuttlebones on metal clips, millet spray clips, removable food bowl holders, and some toys with double clips—or those that are screwed into place between the bars—are made to fit in square or rectangular cages where the bars are equidistant to each other for the entire length of the bar. A square cage gives you more options to accessorize your cage with perches, toys, platforms, bowls, and all of the other accessories you can get to keep your parrot busy and occupied. These toys and accessories are an important part of your bird’s life and they are necessary. For these reasons, it may be easier for both you and your pet to opt for a square or rectangular cage. By doing so, you can provide your companion bird with a comfortable home and provide yourself with an enclosure that is easy to keep clean and well stocked with ​fun accessories your bird loves and needs to keep her happy.